» A 1001 MIDNIGHTS review: CHRISTIANNA BRAND – Green for Danger. A 1001 MIDNIGHTS review: CHRISTIANNA BRAND – Green for Danger. 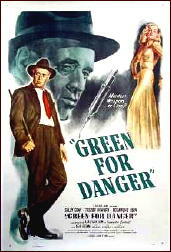 CHRISTIANNA BRAND – Green for Danger. Dodd, Mead, hardcover, 1944. UK edition: John Lane/The Bodley Head, hc, 1945. Reprinted many times in both hardcover and paperback. Film: Individual Pictures, UK, 1946, with Alastair Sim as Inspector Cockrill. 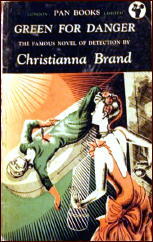 Christianna Brand has written mainstream novels, short stories, and juveniles, but she is best known for her detective novels featuring Inspector Cockrill of the Kent, England, County Police. Cockrill (known affectionately as Cockie) is a somewhat eccentric, curmudgeonly fellow — less a character than a catalyst in the cases he solves. He delights in setting up situations that force the murderer’s hand, and the murderer’s identity usually seems quite obvious to the reader, until Brand introduces a twist designed to delight. 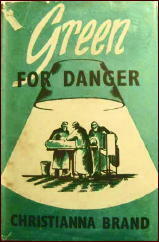 At the beginning of Green for Danger, an unlikely group of characters assemble at a military hospital during the blitz of World War II. Each has his reasons for escaping his previous environment; each has expectations of what this assignment will bring. What none of them suspects is that a patient — the postman who, incidentally, delivered their letters saying they were coming to Heron’s Park Hospital — will die mysteriously on the operating table, and that all of them will come under Inspector Cockrill’s scrutinizing eye as murder suspects. The characters are numerous, but Brand nonetheless manages to instill unique qualities that enlist the reader’s sympathy and create dismay at the revelation of the murderer. The solution is plausible, the motivation well foreshadowed, and the evocation of both the terror and fortitude of those who endured the German bombing is very real indeed. Inspector Cockrill has also solved such cases as Heads You Lose (1941), Death of Jezebel (1948), London Particular (1952), and The Three-Cornered Halo (1957). I was surprised to find Brand was better known for her childrens stories than her mystery fiction, especially the Nanny McPhee stories that were the basis for the Emma Thompson film of a few years ago. But then I guess there is probably a mystery fiction fan somewhere who wonders why A. Milne never wrote anything but that one book and think poetry and not mystery writing was a sideline for Nicholas Blake — C. Day Lewis, the Poet Laureate of England. I read a pretty good story once by a fellow called Bertrand Russell — wonder if he ever did anything?